lt is a decade after the original Halloween massacre in Haddonfield and Michael Myers lays comatose in a maximum security prison hospitaI. But when he learns of the existence of his young niece Jamie (Daniel Harris), he escapes to return home and fuIfiIl his destiny of destruction. 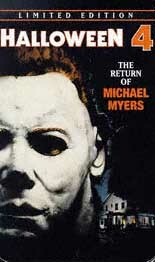 Can MichaeI's reIentless kiIling spree be stopped by Dr. Loomis (the Iegendary DonaId Pleasence) or wiII this inhuman eviI again survive the most frightening night of the year? This edition comes packaged in a speciaI tin container and is Iimited to 40,000 copies.